A warm Sunday afternoon at the Punggol Promenade Nature Walk sees kids riding around on their bicycles and adults trying to keeping a close eye. Situated in Punggol Settlement and right next to 7-Eleven, it is hard to miss this chic and new-looking cafe that just had its doors opened to the public a month ago! 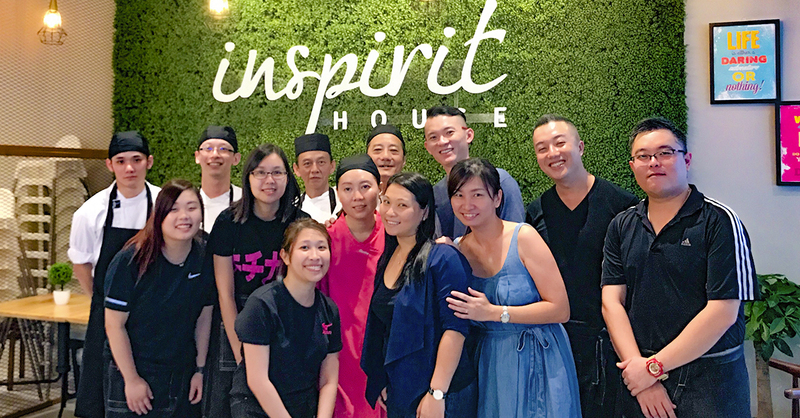 The Inspirit House is a cosy and family-oriented restaurant that aims to unite food and people through specially designed fusion creations. But you might wonder why the word “Inspirit” though? It is defined as instilling life, energy and courage for a purpose. 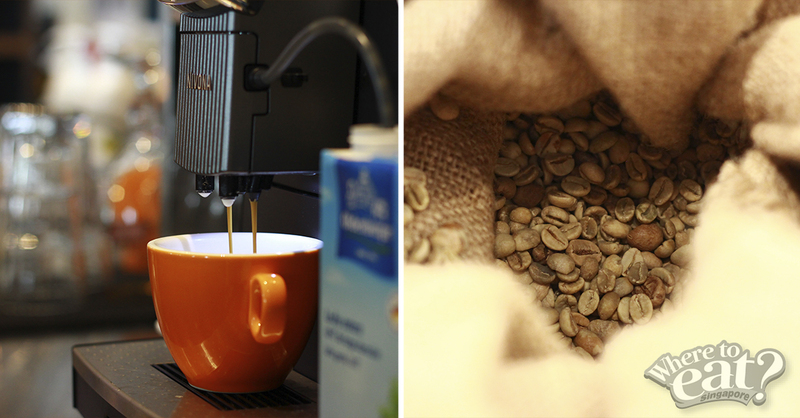 And through this, the 3 owners hope to create a positive and energetic environment as well as a unique experience for all of their customers. Originally strangers, it was akin to Fate when the 3 owners moved into the same block in Punggol. The neighbour bond slowly forged into a friendship as they started to organise potlucks over at each other’s houses. And through much sharings did they realise that they had the same vision. Hence, the decision to embark on a journey with Inspirit House. Thinking that the Inspirit House could very well be like any other Western restaurant due to its high bar seats and tables, we were a little surprised to see a kids play area at the corner of the cafe – which we must say is a pretty clever idea as it caters to families, especially those with young children. But what changed our perspective of Inspirit House was an assortment of Asian-Western fusion dishes to choose from its extensive menus, without having to burn a hole in your pocket. 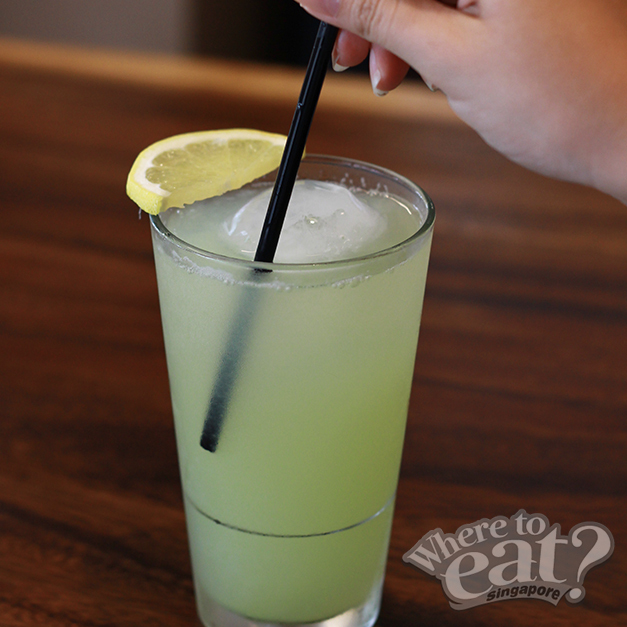 If you are looking for something to quench your thirst, this Cucumber Yuzu cooler drink is the ONE to go. Light and refreshing, it actually takes much effort to make from scratch – only 500g of cucumber juice is extracted for every 1kg of cucumbers. That’s not it, we were curious about the ice cube ball too, which we then learnt from the owner that it was used as it melts less faster than normal ice cubes. Take a bite into the succulent Premium Alberta Pork Loin steak and chew the tenderness away. Unlike any other dish that requires the pork to be well-done, this black pork was grilled and baked to medium perfection – showing off slightly pink meat in the middle. According to the head chef, this is the only type of pork that can be cooked to a medium perfection. Although the pork loin was seasoned with only salt and pepper, the combination of the mashed potato and pear sauce is scrumptious! 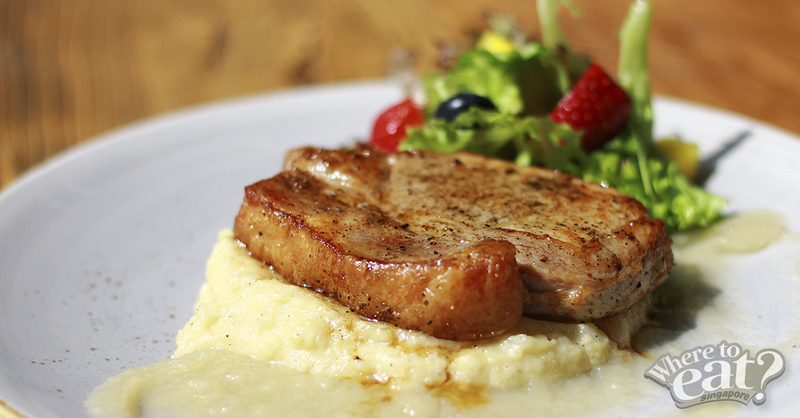 It’s no wonder the Pork Loin Steak is one of the popular dishes in Inspirit House. The black pork might be the star of this dish, but our favourite goes to the pear sauce and mashed potato with its cheesy bits and buttery taste. An Asian-Western fusion dish that comprises of the delectable mashed potatoes, homemade Rendang sauce and the fruit salad by the side. 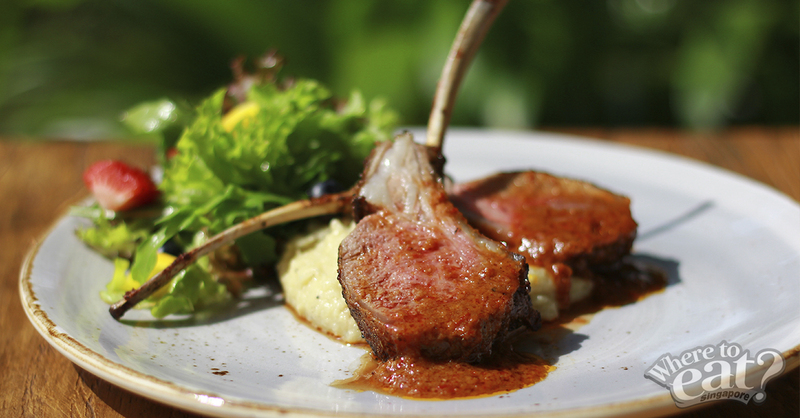 The lamb cutlets were cooked to medium rare perfection and very much tender. However, some might feel that the Rendang sauce is bit on the sweet side and not the very least spicy – almost similar to the sauce that we would always pair up with our satays. Invented by one of the owners, Shirley, the Truffle Chow Mien is a quirky fusion dish that packs a spicy punch. Immersed in the pork broth that was simmered for many hours, the al-dente noodles holds much flavour. If you take a closer look at Chow Mien, it’s not the yellow mee that you often get in Singapore. 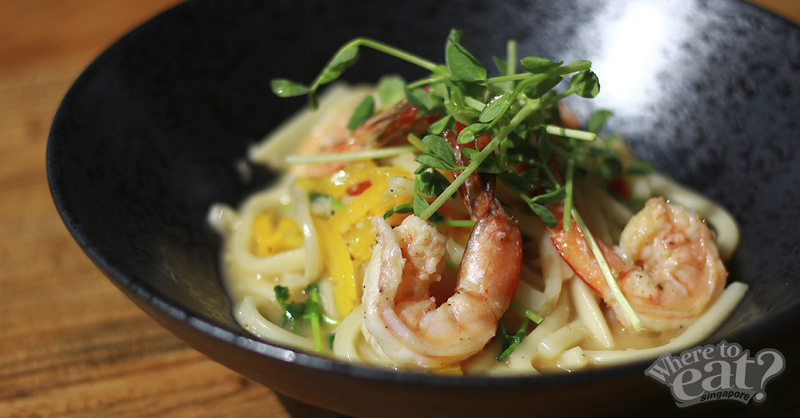 Instead, Inspirit House used KL mee – a similar texture to the Japanese udon noodles. There is no doubt we could taste the truffle in the chow mein, but the spiciness of the chilli ended up overwhelming it. So if you are not a chilli fan, this Truffle Chow Mien might be a little too spicy to your liking. However, that is not a worry as you can always request for a non-spicy version. 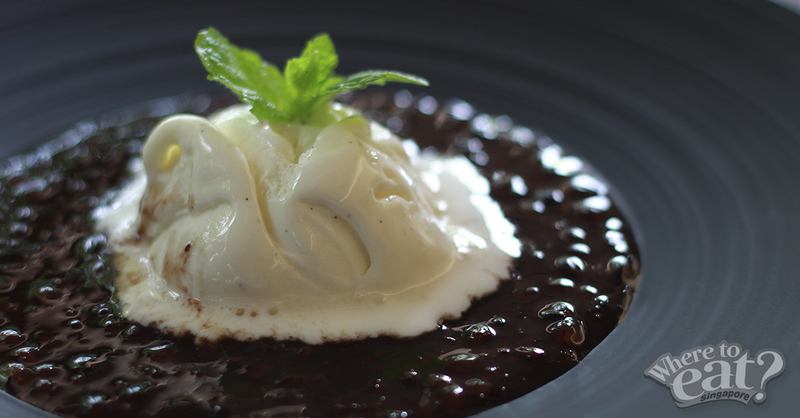 A slight modern twist to the Black Glutinous Dessert was presented – featuring Inspirit House’s homemade vanilla ice cream instead of the usual coconut milk. Half expecting the dish to turn out sweeter than normal because of its ice cream, we were thrown off guard when the sweetness was just right. Also, the dessert had a light and milky oopmh instead of the usual heavy, creamy taste that coconut milk gives. 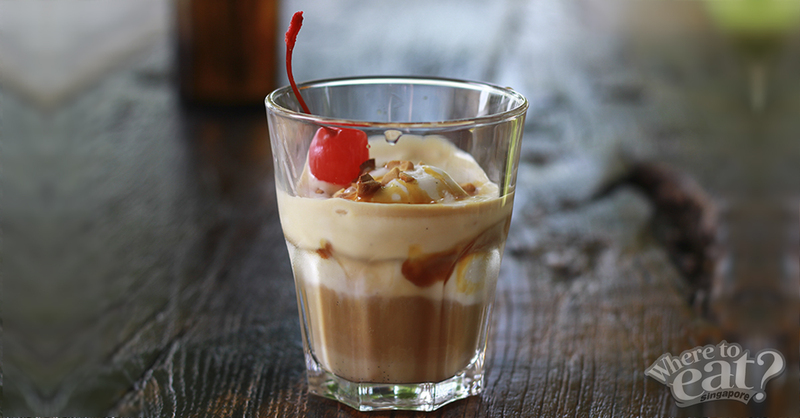 The lucky us managed to taste a sneak peek of Inspirit House’s upcoming Affogato with Baileys that leaves you wanting for more. A great spot to chill at, be it it’s in the hot afternoon or the late night – whether you have just completed a run at the nearby Punggol Promenade Nature Walk or catching pokemons. Overall is a nice place to chill out with friend and family!! !